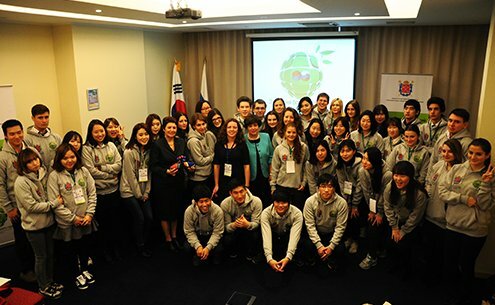 Russian-Korean Youth Dialogue "Ecology of big city"
On November 18-25, St. Petersburg hosted the Autumn School in the framework of the Russian-Korean Youth Dialogue, commissioned by the Committee on Youth Policy and Interaction with public organizations for the third consecutive year in Hotel Park Inn Pribaltiyskaya. We ensured the joint research, discussion and cultural events, sightseeing tours, and meals for students of Russian and Korean universities. In addition, we provided accommodation and visa support for the Korean attendants of the Forum. Technical support, moderators and experts, assistance for foreign participants were included in our responsibility as well and was successfully implemented. The event was attended by the Consul General of the Republic of Korea in St. Petersburg Mr. Lee Yeon So, the Chairman of the Committee on Youth Policy and Interaction with Public Organizations A.N. Parkhomenko, the President of the St. Petersburg Association of Korean Citizens Mr. Roh Sung Chung and others.